CHRIS AND VICTORIA Kelley are two of the most interesting, creative and fun-loving people we know. They own Table 16 Productions and we've worked on several projects together. Chris has used Second String Music locations for several videos and feature film projects. Chris and Victoria decided to celebrate their 10th wedding anniversary with a vow renewal ceremony. 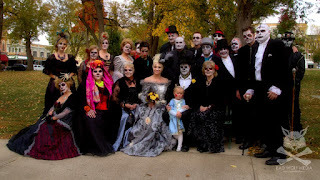 We gathered in Washington Park, and the theme was Victorian Era meets the Walking Dead . The ladies and gents dressed up in the fashion of the day and got properly zombified with makeup. Cori Lyssy and I played at the ceremony, with the help of Craig Freeman on cowbell. Yes, we played "Don't Fear The Reaper." Yes, it needed more cowbell. Craig did a great job. Cori dressed up as a gypsy and I was Dead Gold Lamé Elvis. It was perfect. We gathered by the Washington Park fountain for the short ceremony, then did a pub crawling before ending up at Martini's 515. HartLyss played for the party and had a blast. You gotta love a gig that is literally two doors down from Second String Music. I can now say I've played in the streets of Quincy, as we led the procession from bar to bar. We also crashed a wedding reception at Winter's West Wing - yup, Dead Elvis and The Gypsy got plenty of stares. We knew the bride and groom. It all worked out. What great fun! It was an honor to be part of the event. I need to take a nap until Tuesday.